I left home at 4:30 AM to make the three hour drive to Crawford Notch. I didn’t bring Muffin this time because I knew the snow would be too deep for her. On the way to the AMC Crawford Hostel at the north end of the notch, I passed the Mt Washington Hotel, and stopped by the side of the road to take a picture in the pinkish early morning light. The mist was rising from the meandering Ammonoosuc River, and the sky was clear and cold. It looked like it was going to be a good day for a climb. 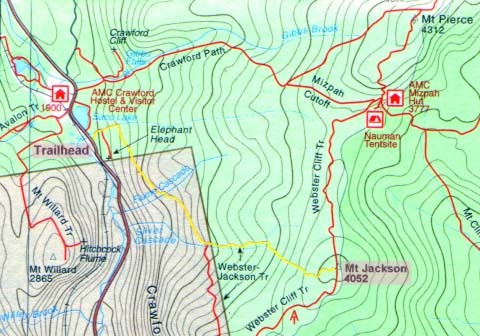 Next, I stopped at the Crawford Hostel to check on trail conditions, and to possibly rent a pair or snowshoes. I didn’t want to take any chances of not making the summit after my failed attempt in December in the unbroken snow on the trail. The caretaker said I probably wouldn’t need the snowshoes since the trail was firmly packed, so I just bought a Crawford shirt, and left. Before hitting the trail, I wanted to call home, but the phone wasn’t able to make a connection at this spot in the notch, so I had to drive a couple of miles north back to where the reception was a bit better. 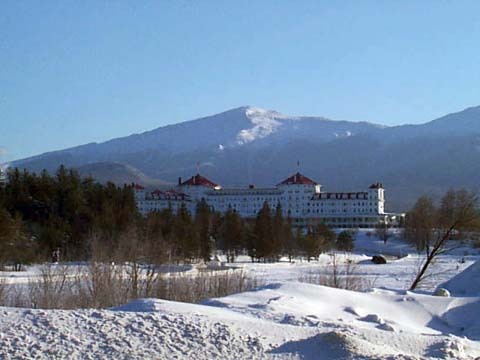 After making the call, I stopped to get another picture of Mt Washington and the hotel now that the light was brighter. The summit of Mt Washington was clear and sunlit, something you don’t always see at this time of year. Finally, just after 8 o’clock I pulled back into the trailhead parking lot and gathered my things together. In the car next to me were a couple who were going to do some technical climbing nearby. After commenting on the good weather and wishing each other good luck, I put my pack on, grabbed my poles, and headed across the road to the start of the trail. 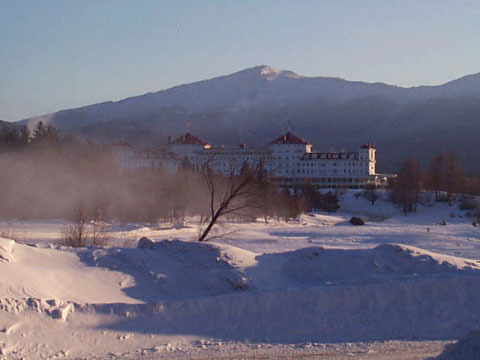 Mt Washington and the Mt Washington Hotel at 7:30 AM. Note the pinkish-orange tint from the early morning sun. The mist over the field is rising from the Ammonoosuc River whose waters are much warmer than the -10 degree air temperature. Mt Washington and the Mt Washington Hotel at about 8:00 AM. Note that the pinkish tint has faded during this last half-hour, and mist has disappeared. The temperature, however, is still -10 degrees. 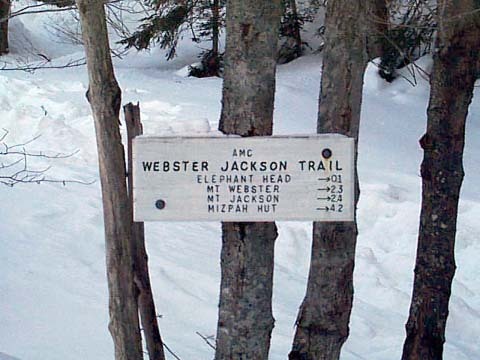 The trailhead for the Webster-Jackson Trail. This trail begins about a 1/4 mile south of the AMC Crawford Hostel across from a small roadside parking area.